Ward Stearns Orsinger was born in Des Moines, Iowa and reared in St. Joseph, Missouri. He graduated from the University of Minnesota with a degree in Agriculture. After serving in WWI as a Lieutenant in the Army Engineering Corps in France, he moved to San Antonio, Texas with his brother Gunther. Together they founded the Orsinger Motor Company and were the first to put cars like the Haines, the Star, the Durant, and the Hudson on the streets of San Antonio. 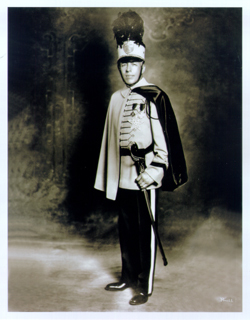 Ward was one of the founders of the Texas Cavaliers and served as King Antonio XVI in 1934. He helped design the King's royal blue uniform including the cap and red feathered plume after the French military uniforms of the time. He was also instrumental in starting the Fiesta River Parade. His love of horses and riding kept him active in the early years of the San Antonio Rodeo and Livestock show. Ward loved people, traveling, cooking and helping others. Ward's early involvement in San Antonio helped set traditions that are prominent today and enjoyed during Fiesta Week. He will be remembered for his community awareness and entrepreneurial spirit in the development of San Antonio. © 2015 Genevieve & Ward Orsinger Foundation.